The students with special needs at Lafayette Jefferson High School express their appreciation to Purdue’s Pi Kappa Phi members in various ways – through hugs, high fives and smiles. 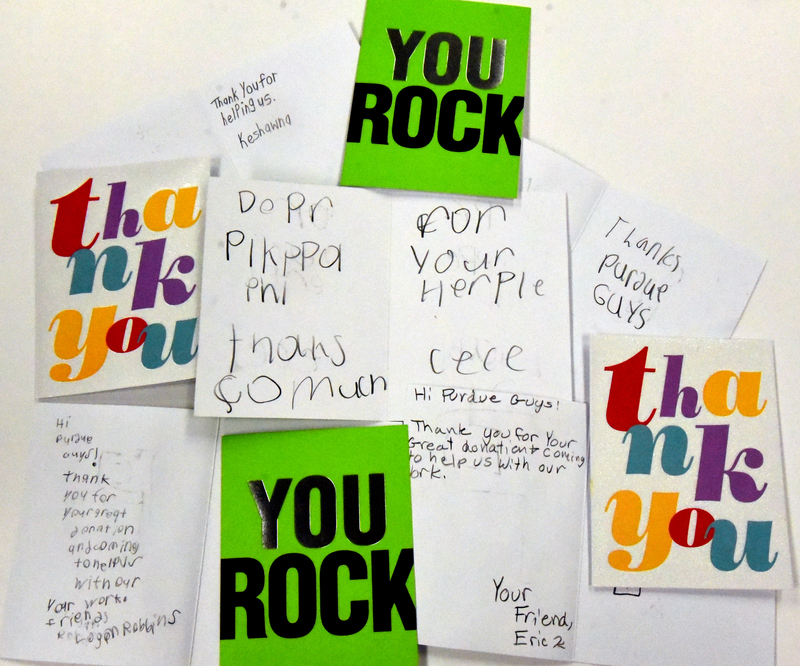 As they often do at the end of each term, those students who can write send thank you notes to the fraternity. “Hello Purdue Guys! Thank you for great time coming into help. Have a great summer! Your friend,” one student wrote among the nearly a dozen cards sent to the chapter house in late May. Fraternity members assist students with life skills during Purdue’s academic year. That might include learning to make change, grocery shopping or developing interpersonal skills. Brothers may work with students with geography, math or reading, too. The high school students may have cognitive, physical or developmental disabilities. The Ability Experience Circle of Giving Grant donates at least 25 percent of the chapter’s annual philanthropic fund-raising to local agencies. At the April 2018 Moms Day celebration, Ability Experience CEO Basil Lyberg presented the chapter a $6,500 check for Lafayette Jeff’s special needs classes assistance. Lyberg was the keynote speaker at Moms Day. Since 2009, the Ability Experience/Omega chapter have given the school $39,689. That money goes toward classroom outings such as zoo visits and weekly bowling. It also assists in purchasing classroom supplies and iPads, some of which enable non-verbal students a way to communicate. At Moms Day, Lyberg thanked the chapter for its commitment to help people with disabilities. The fraternity’s Ability Experience programming and fund-raising helps set it apart from other chapters on the Purdue campus. While being No. 2 (of 41 fraternities) in grades in the last reporting period, Pi Kappa Phi was No. 1 in philanthropic fund-raising and community service hours – both by wide margins. With volunteer assistance and grants, Pi Kappa Phi is making a difference in the community.